To celebrate the Christmas season, the Family Library has brought out a new book, Qibti fi Asr Maseehi (A Copt in a Christian Era) by Zebeida Mohamed Atta. The publication includes a colour booklet with pictures of sculptures, decorative objects and Fayoum Portraits. The book tells the story of Egyptians in the Christian era, and Dr Ishaq Ebeid mentions in his introduction that it will be a valuable addition to the historical section of the Arab Library. The author’s general conclusion is that the Egyptian personality possesses a clear continuity that connects its past to its present. Its history represents layer upon layer of various cultures. Dr Ebeid calls the book a distinguished and exciting work that takes the reader on a historical and scientific tour with historical incidents, theology, philosophy, politics, economy, categories of the community, arts, customs and traditions along the way. The first of the book’s three chapters focuses on the humanitarian component of the Egyptian person in the period immediately following the introduction of Christianity to Egypt. Dr Atta studies the features of the Copt in the Christian era by reviewing the opinions of various historians who wrote about the Egyptian personality, its negatives and positives, in various eras and under successive rulers. Among the negatives is a form of submission to the ruler and a tendency to inaction towards conditions officially imposed on the people. This eventually leads, in its most harmless form, to an ironic and rather bitter humour; on a worse level to prejudice and poor handling of religion; and at its most extreme to mob violence. Egyptians regard themselves as moderates and religious at heart, and this works as a connection of the past to the present. 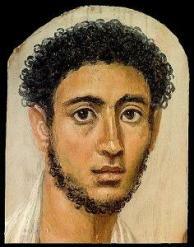 Both past and the present exist in an Egyptian’s mind; the faces of the Fayoum portraits dating back to the first century AD mirror the features as those of a friend or relative. The second chapter analyses the Graeco-Roman community of Alexandria, which was regarded as a foreign community before it was taken over by the Church of Alexandria and religion became public. Dr Atta makes use of a number of surviving papyri that reveal much about this community. Among them are personal letters expressing sentiments of love and motherhood; as well as supplications, magic, charms, and spells which together present a panoramic picture of a community that was part of Egypt for six centuries. Social life is the main theme of the third chapter. This includes further details of urban and rural life and preoccupations with issues from farming and land to literature, sciences and the arts. Although the publication of such an encyclopaedic work is welcome, some of Dr Atta’s points are contentious. She alleges that Christians were responsible for the burning of the ancient Library of Alexandria, yet does not provide a single shred of evidence for this, or even that the Great Library was ever burnt at all. Copts pushed back into Church?